When I was living in Hong Kong I heard about the Bungee Jump in Macau – the highest one in the world! – and it fall straight away into my bucket list! In July 2014 I decided to do it on a sunny Sunday and it has been seriously one of the craziest experiences of my life! It is definitely one of the most fun -and scary- activities I did in my life, but I would surely recommend it if you like this kind of adventures as it is very safe and the staff is highly qualified to take care of you! My friend and I took the TurboJet ferry from Hong Kong Central Pier to Macau (Click here to find the updated schedule with prices). In 1 hour we arrived there, we got quickly a visa on arrival and took a taxi to the Macau Tower! When we got out the taxi and looked up the tower, we were both shocked by the height! I was actually excited and scared at the same time! AJ Hackett Macau is the company that own this business, they are very professional and kind! If you like check the website click here. When I got up to the bungee floor I had to sign the documents and get prepared with the other jumpers. You can choose to wear also a gopro camera provided by AJ Hackett with extra money. Waiting for my turn while feeling the wind on my face and seeing the buildings in the city so tiny made me quiet nervous, but I controlled myself pretty well! If you like to watch the full video of my jump, please click here! 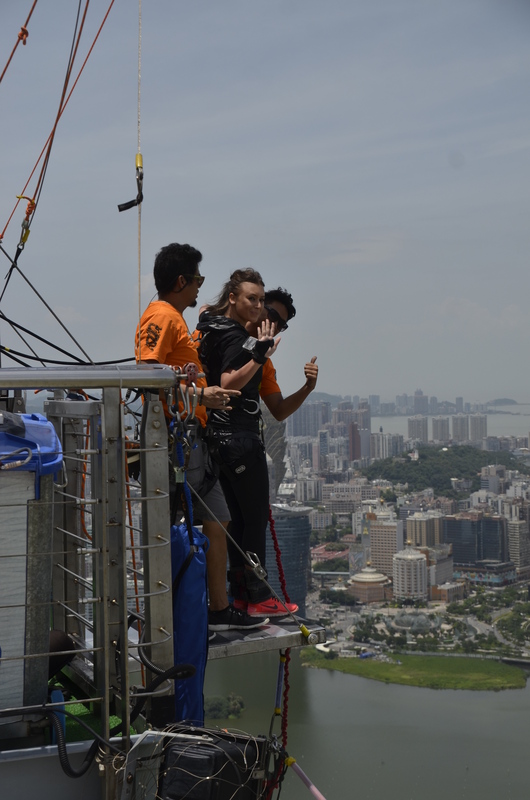 Myself on top of Macau Tower! 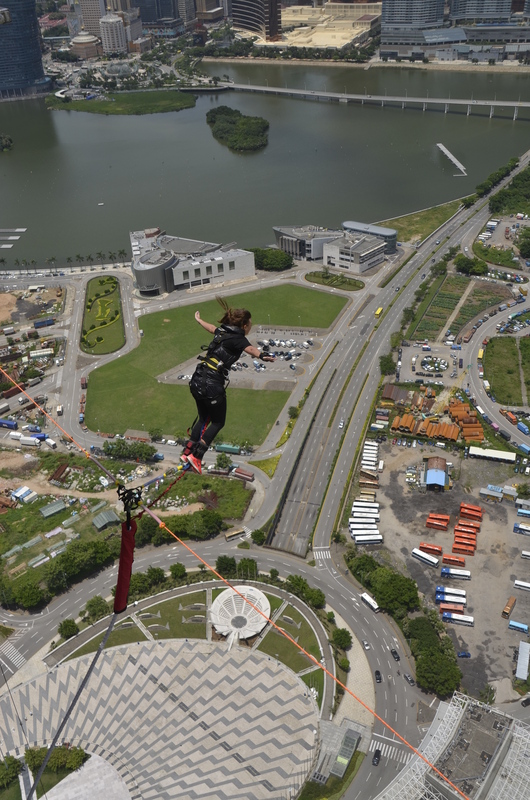 Macau Tower Bungee Jump is the highest in the world: 233 m! It cost approximately 500 USD (HKD 3.988). Myself few seconds before the jump! After the jump I was overexcited and my level of adrenaline was out of control! View from above pt.2! 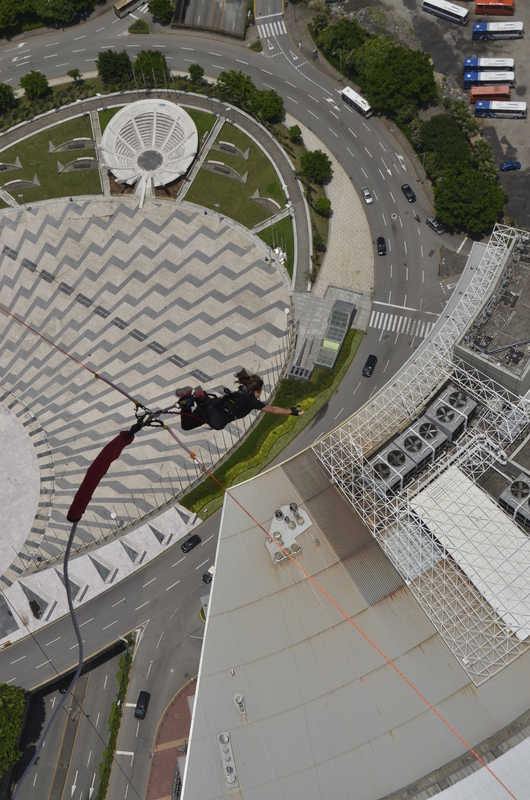 Macau Bungee Jump! My friend and I had a great lunch at the 360 restaurant inside the Macau Tower: from our table we could see people jumping off the edge of the bungee platform! I would suggest to book it in advance. Remember to do the bungee only if you are very firm and secure before going up there. I hope my post can motivate you to try this experience!